Suh can retire the best defensive lineman or best defender ever. Calvin can retire the best wide receiver ever. Stafford revived a franchise with no pulse, has the strongest arm in the NFL, and can lead us to a Super Bowl win. Suh is the only one making unnecessary money, and it's not that bad for a great DT. He's making around 16 million this year and around 20 mill next year. That is absurd for a DT but it's 2 seasons. A Stafford restructure, release of Corey Williams/Jeff Backus/Best/Raiola and Burleson's contract ending will solve every issue, and it's evident that Mayhew has learned. He just got us the best cover safety in this year's free agency (it's not Goldson, he's overrated) for 5 million a year, replaced Corey Williams with a guy we'll pay $1 million less each year on average, got us a guy who will make a safety creep up sooner or later, and retained our only good DB who stays relatively injury free for a reasonable price. All of these signings will cost an average of $17.5 million a year, and he filled 3 needs and got a great depth player with that money. You can't say that aside from slightly overpaying Bush, he didn't make some shrewd moves and improve this team. Also, of the teams you listed, some are wrong. Percy Harvin is making an average of $11 million. Brady is only making less than $10 million because he wants at least 1 more ring. Patrick Willis will this year or from next year on be making over $10 million or more a year. Last edited by LionsAllDay on March 14th, 2013, 2:47 pm, edited 1 time in total. so drew breese signed a contract for 100 mil over 5 years and he's NOT making 10 mil a year??? Tom Brady's cap hit for 2013 is $13 million dollars, even after his reduction in salary. That's what I based my numbers off of. It only seemed fair, after all, why should a team benefit for giving a huge SB and low salary. I don't care about next year, I care about THIS year. The current trend in the NFL is to spread talent out over the whole field and not have holes for the other team to take advantage of. We have several holes, and they're exploited regularly. This is more of the same.. I point out how NO TOP TEAM in the NFL has more than ONE player making over $10 million, and you argue that one more guy should be on SF's list... You miss the whole point. "Blasphmey! is what old dogma says to new truth..."
RE: Seahawks... Harvin's cap hit is only $4.9 million in 2013, but it doesn't take away from the point. He would STILL be the only player that was making over $10 million dollars (but he's not). There is still ZERO top teams paying two guys more than $10 million per, and we're paying three... You don't see an issue with that? Last edited by wjb21ndtown on March 14th, 2013, 3:03 pm, edited 1 time in total. I apologize, sport trac was still listing Drew's 2012 salary, which was right around $10 million. His 2013 salary is actually $17 million in total cap hit, but again, don't digress from the point, that's still their ONE AND ONLY player making more than $10 million dollars. Here we go again...how many #1 and #2 draft picks from the final pre-rookie wage scale years do those teams have? Where are SF or Seattle going to be in 2-3 years when all of these great draft picks need extensions? You know this stuff is fluid. We really don't have that many big holes. The only major ones are safety, DE, OLB, and CB/WR/LT can be considered needs but not big needs. There are still some good DEs on the market. Delmas may come back. I don't know about OLB, though. I don't see us bringing Durant back. For the smaller needs, WR can be filled with a speed guy like Heyward-Bey, who would probably come relatively cheap, CB will be fine as is if we get some good safeties, and we take our pick in the draft with 3 very good LT prospects. 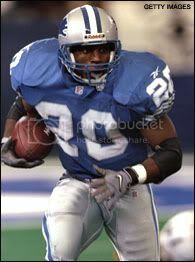 Now, who knows if one of the small-name guys like Whitehead, Greenwood, Hilliard, Fox, Carey, Willie Young won't step up? They all have the talent to be at least decent starters, and I'm sure one or two will start next year and do fine. Bentley, too. The guy was playing with a messed up shoulder all last year, so no one can judge him yet. Last edited by LionsAllDay on March 14th, 2013, 3:12 pm, edited 1 time in total. Lomas, IT DOESN'T MATTER where someone was drafted. The point is, you can't have three or four guys making that much money, period. We have/had an opportunity to trade Suh and rectify that matter. It doesn't matter that he was drafted high, it doesn't matter that he had a pre-rookie wage scale contract, we COULD have gotten rid of him mid-season this year, and FIXED THE PROBLEM (or at least a good part of the problem). And again... Staff and CJ would be making what they make on any team, rookie wage scale or not. Suh is the issue, and he should have been dealt, not extended or "restructured." If you didn't throw a fit every time you hear Stafford and Suh extension talk you'd have your answer. Both those guys could have their cap hits brought down below $10M. Let's also not forget the Ravens won a super bowl with 3 $10M guys in Ngata, Suggs, and Reed. Only Suggs plays a position that is normal a high pay spot. I'm not a fan of how Mayhew manages the cap, but it's still possible to build the team the way its going and it's all a moot point now anyway because Suh can no longer be traded without causing more harm than good. Last edited by rao on March 14th, 2013, 3:13 pm, edited 1 time in total. Hahahahaha... "We don't have many big holes, just these 6!!!" An LT, and we have a question mark at RT (But I will concede that if we move Reiff to OG it aleviates the OG need). We have to trot sub-standard players like Jason Jones and DeAndre Levy out there BECAUSE WE PAY OUR OTHER GUYS TOO MUCH. Also, what have the Raven's done? They've done VERY well in the draft, and they've built their offense the exact opposite of most teams in the NFL, which, up to this point, has helped them save money. Now that Flacco is earning more and their players are getting older, Baltimore is going to die. They're going to have to change their entire philosophy. They can still be a blue collar tough D team, and Ray Lewis' mark will remain on that team, but they had leadership and grew boys into men on that team... They got a lot of production out of a LOT of their lower end talent, and look what they did... Let their #1 WR walk... They didn't "re-structure" him, they didn't kick the can down the road, they said "thanks!" and how many top 5 picks did those teams have back before the rookie wage scale was implemented? you keep looking at only 1/2 of a picture and sqeezing that in to fit your perspective. I found at least 6 players off the top of my head that make over 9 mil last year...but yet you dont bring them up....cuz it doesnt support your arguement. plain and simple: there is more than one way to build a winner...if there was only one everybody would be doing the same thing. We're not "doing it wrong". we're doing it differently than you would. Thats all you have managaed to prove in your rants all year long. Last edited by regularjoe12 on March 14th, 2013, 3:18 pm, edited 1 time in total. Corey Hilliard has been playing at both OT spots, but primarily RT for 4 years now as a back-up spot starter for the Lions. If Reiff moves to OG they have a RT with experience. Please read the end of my last post, edited it. The mistakes Mayhew has made is irrelevant to your initial argument that winning teams can't be built with 3 10M+ players. It can be done, but it's not easy. Baltimore has had 3 big pay players for a long time now. Suggs, Reed, and Lewis have been with the team for a long time and they were the big three there before Lewis lost a step and played for less money. Again they payed a guy in Lewis at a non premium spot and it worked.